Top sirloin steak, sometimes referred to as London broil, is a choice beef cut for those wanting a fuller beef flavor. The lean, yet marbled, meat of a sirloin steak makes it suitable for slicing down for meals or using the cut-up steak for recipes calling for tender beef. 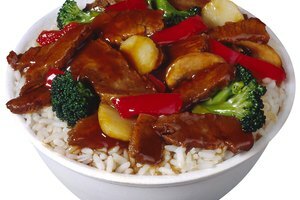 Depending on how you will be using the sirloin steak, you may be able to use a substitute cut of beef if you do not have access to a London broil. Choosing an alternate depends on your recipe and how much you are willing to spend. 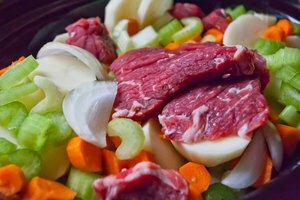 Top round steak is an option for recipes that will involve liquid and slow-cooking methods. This cut of beef has less fat and marbling than top sirloin, which causes the meat to dry out when cooked if liquid is not used throughout the cooking process. Chuck cuts of beef originate from the shoulder section of a cow. 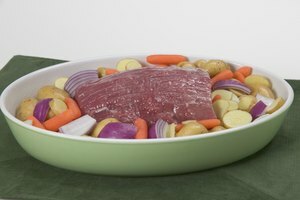 This option for replacing top sirloin works best for roasts, crock pot dishes or when marinated and grilled. One thing to keep in mind is that many chuck steaks and roasts come with a bone, which will have to be removed if it is to resemble a top sirloin. Flank steak is a tougher cut of beef that comes from the abdominal area of the cow. Using this cut as a substitute for top sirloin requires dishes that are slow-cooked or braised in liquid, which helps tenderize the meat. For recipes calling for ground top sirloin, such as stews, chilis and meat-based sauces such as spaghetti sauce, opting for ground chuck or generic ground beef can shave a little cost off of the meal. Choosing a leaner ground beef will make this substitution work best. If you are in need of tender beef and cannot find top sirloin, using traditional steak cuts can suffice. This option works well when grocery stores or butchers are running a special on steak, sometimes making the cost comparable to that of top sirloin. Using these substitutions is best for dishes where the top sirloin is cut in to cubes or strips. You can slice porterhouse, New York strip, filet mignon or even T-Bone steaks into strips that would have the same use as top sirloin prepped in the same manner. What Is Round Steak Good For?